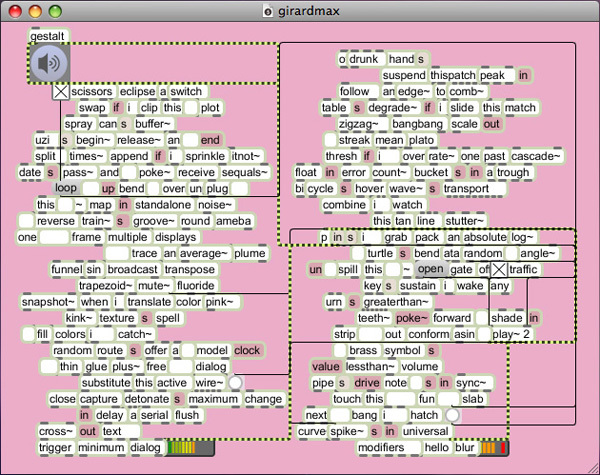 In order to play it, you may download a free trial of Max/MSP/Jitter on the Cycling '74 downloads page, here. If you're not interested in creating your own projects with Max/MSP/Jitter, you may also download Max Runtime which is freeware that doesn't include editing capabilities. Max Runtime is on the right hand side of the downloads page, under "Extras." At the forefront of what I find interesting about Max/MSP is the visual aspect of code. The code is set in a myriad of uniform and white rectangles interwoven from an architectural substructure of boxes to form a larger hierarchical box connected to cables or black lines. About 200 predefined object codes not only mimic the visual and aesthetic interface of Max, but will function as a poem and run the program that streams poetry. The elements of this project like the sound filter and the background color visually demonstrate how the evolving imagery can be interwoven into poetry.